The top story pushed by the media on Wednesday was false, according to a new report in the New York Times. As the first-ever picture of a black hole was unveiled this week, another image began making its way around the internet: a photo of a young scientist, clasping her hands over her face and reacting with glee to an image of an orange ring of light, circling a deep, dark abyss. It was a photo too good not to share. 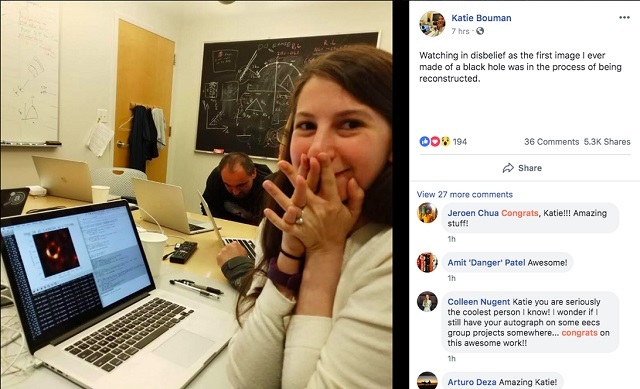 The scientist, Katie Bouman, a postdoctoral fellow who contributed to the project, became an instant hero for women and girls in STEM, a welcome symbol in a world hungry for representation. Public figures from Washington to Hollywood learned her name. And some advocates, familiar with how history can write over the contributions of women, quickly moved to make sure she received the recognition she deserved. 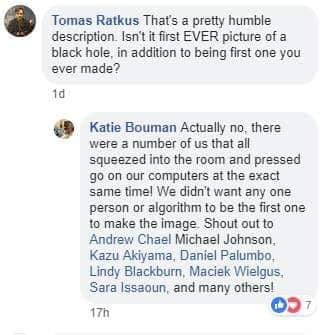 In their eagerness to celebrate her, however, many nonscientists on social media overstated her role in what was a group effort by hundreds of people, creating an exaggerated impression as the photo was shared and reshared. 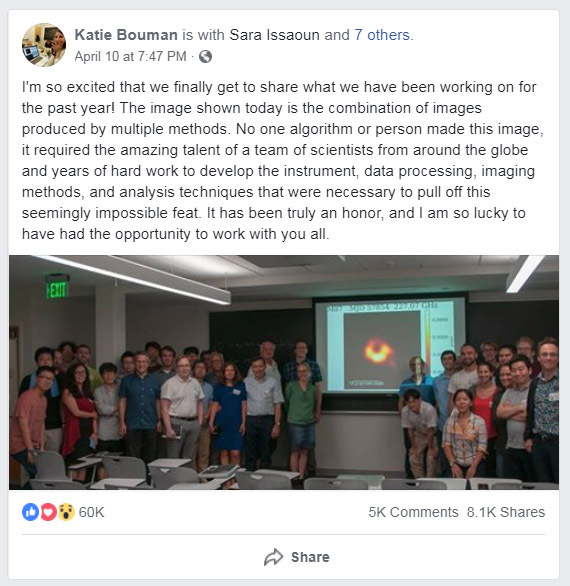 [...] While she led the development of an algorithm to take a picture of a black hole, an effort that was the subject of a TED Talk she gave in 2016, her colleagues said that technique was not ultimately used to create this particular image. After the burst of publicity spread her smiling face across Twitter, Facebook, Reddit and news sites around the globe, Dr. Bouman did not initially respond to requests for comment Thursday. In a Facebook post, she said: "No one algorithm or person made this image. 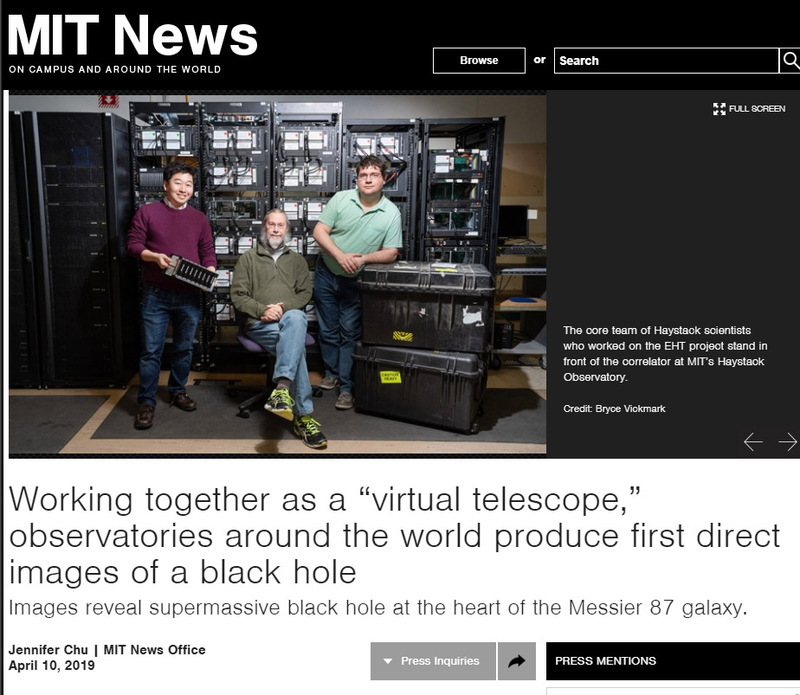 It required the amazing talent of a team of scientists from around the globe." "It has been truly an honor," she added, "and I am so lucky to have had the opportunity to work with you all." In a text message late Thursday night, Dr. Bouman said that she had to turn her phone off because she was getting so many messages. "I'm so glad that everyone is as excited as we are and people are finding our story inspirational,'' she wrote. "However, the spotlight should be on the team and no individual person. Focusing on one person like this helps no one, including me." The top left portion shows the coding contributions of their team on GitHub, which is public data. 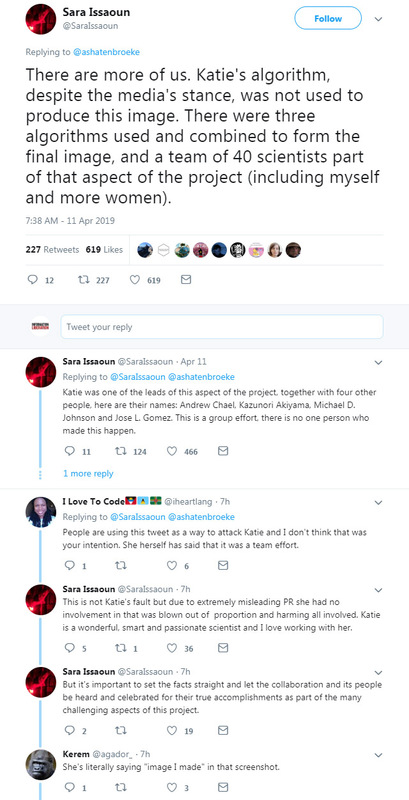 The top right shows Andrew Chael, who contributed the most lines of code to the project (of course, not all lines of code are created equal). I'm sure the thousands of media outlets, political pundits and politicians who got this story completely wrong will correct the record any day now!